This Officially Licensed Dale Earnhardt Jr®. 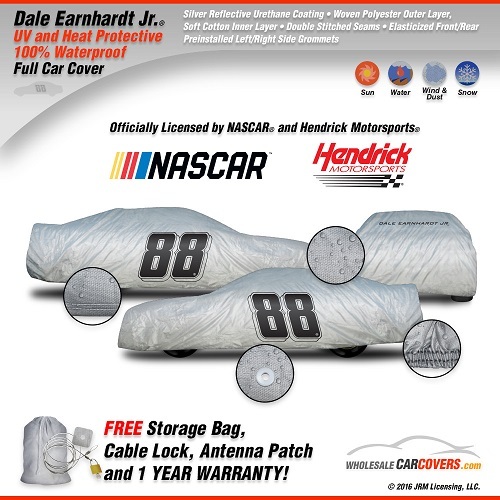 car cover features an oversized 88 on both the drivers side and passenger side of the cover. The name Dale Earnhardt Jr® is also printed across the back. We offer two materials to choose from. A Deluxe fleece lined, 100% waterproof car cover with a suggested retail price of $249.99 and a Premium lightweight all weather car cover with a suggested retail price of $99.99. Both come with warranties against manufacturer defects as well as a free cable lock for the deluxe cover and storage bags.